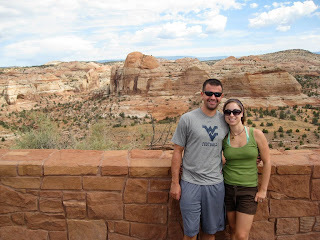 After writing posts about all of the countries and cities we’ve visited, it feels funny to write about a trip to the US as a “vacation.” It’s our home. But, being the big country that it is, there are always an endless number of places to visit. We definitely made the most of our trip this time, being back for almost 3 weeks, driving 2000 miles in 5 states, and seeing a ton of friends and family. We flew in the week before Christy and Vegar’s wedding, so that Chad could drive down to Vegas with the guys for the Bachelor party. Christy also had her Bachelorette party that Friday in SLC with the girls. Both were a blast, of course. That Sunday, the guys drove up from Vegas to southern Utah, and Christy and I drove down to meet them in Zion National Park. We camped for 2 nights there around Zion, Bryce, and Calf Creek. The first day we went on a hike in Zion called “The Narrows,” which follows the creek/river that winds up the middle of the canyon. Most of the time you are actually walking in the water, which can get as deep as your waist. On either side of you are steep, sheer sandstone cliffs that are the tallest of their kind in the world. It was a really beautiful and impressive area. I had no idea that there were places like this in the US. 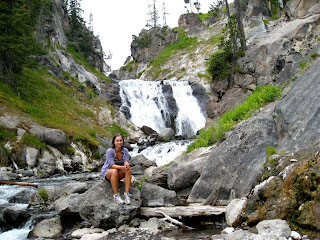 It was incredibly hot this day, and temperatures reached around 110 degrees F. After our hike, and lunch, we put on our bathing suits and hoped in the creek at a swimming area that had a little waterfall and swimming hole. It was very refreshing. 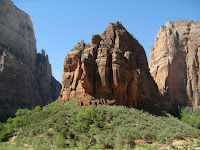 The drive between Zion and Bryce was also a site to see. Part of the road (called “Hell’s Backbone”) was a narrow two lane road on top of a mountain that had steep drop offs on both sides. In the distance all around are gorgeous rock formations and mountains of all shapes and colors. Bryce characteristically has the red rocks that look like pillars made of stacked pebbles. We saw many of these mountains on the drive. 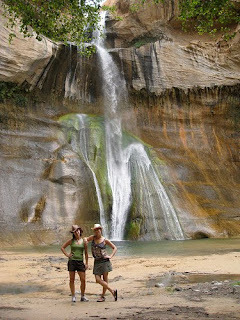 Instead of going into Bryce to hike, Vegar & Christy took us to Calf Creek. 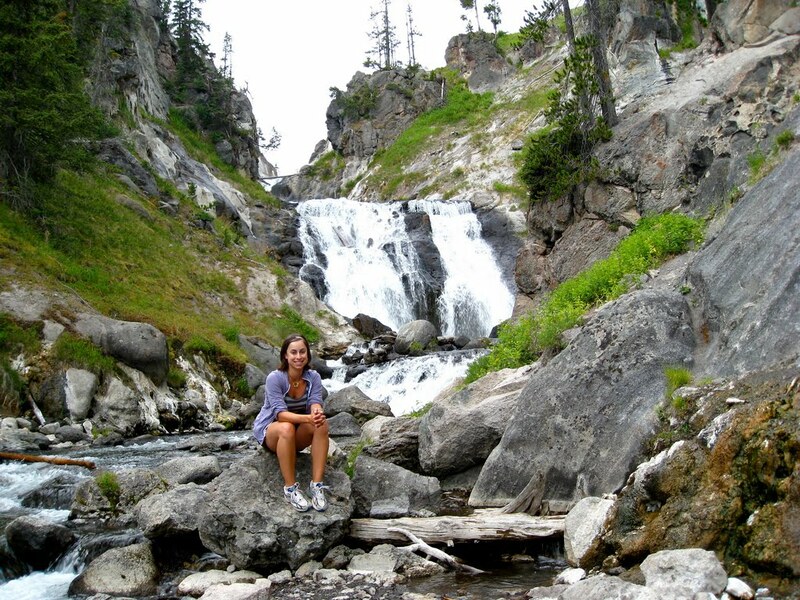 Here we hiked out 3 miles in the canyon, and came to a breathtaking waterfall. It reminds me of the lagoon in the movie The Beach. It was isolated, beautiful, and peaceful. The tall waterfall drops off of a stone wall into a clear blue pool of water. The pool is surrounded by a tiny beach area with sand and trees. It feels like a hidden, private beach. It was incredibly hot on the walk out to the falls, & we were going through a lot of drinking water. So it was a good thing that it started to rain a bit, because the clouds and rain cooled everything off. On Wednesday, Chad and I drove all over Salt Lake City. It was fun having a car again and being able to go wherever you want. We did some shopping, went to a coffee shop, and went to the gym. It was pretty normal stuff, but it has been so long since we’ve had a day like that, that it was really fun for us. On Friday, before the wedding, there was a cookout in the park for all friends and family who were in town. We had great food and played soccer and volleyball. Then Saturday was the big day. My mom and Christy and I got “mani’s and pedi’s” in the morning. And, we went to get our hair done, where they gave us sparkling water & wine! Fun. We headed up to the lodge to finish getting ready and hang out in the bridal room. 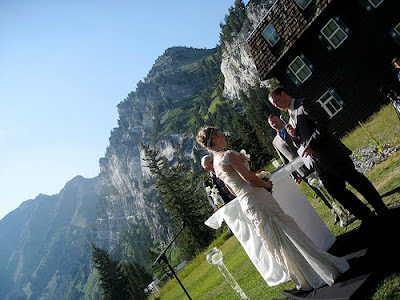 The wedding was really beautiful, with the mountains as the backdrop, and the su n shining. 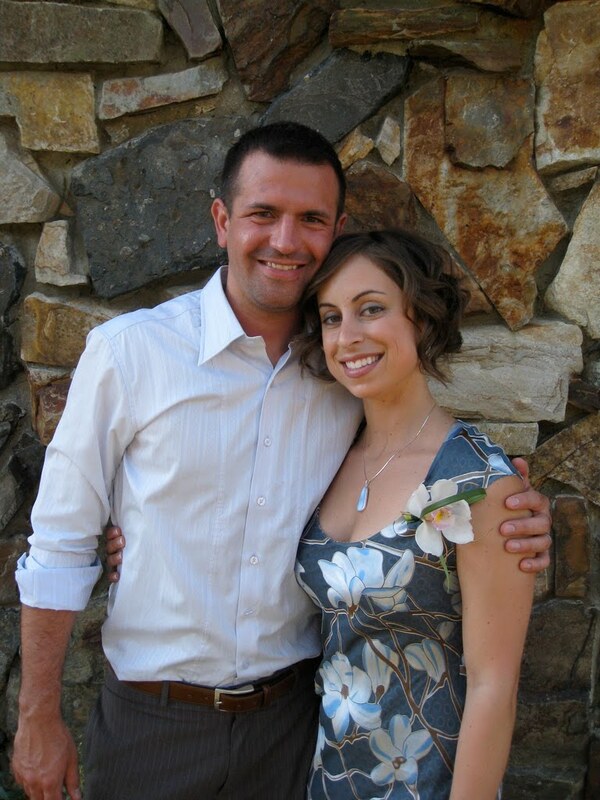 The service, and their vows, were very meaningful. After a delicious dinner and desert, we danced the night away. Sunday was a difficult day. We had to eat a delicious brunch and then sit by the pool all day. I don’t know how we managed. On Monday, it was off to the races again. 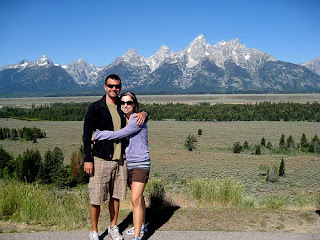 Chad and I headed up to Grand Teton and Yellowstone National Parks with Gisle and Simona, both friends of Vegar’s from Norway. The trip up was quite an adventure, and included a stop at the Beef Jerky stand on the side of the road, and a café in Paris Idaho which did not serve coffee. But, mostly because we drove through a storm equivalent to The Nothing, in The Never Ending Story. The Grand T etons are a beautiful row of mountain peaks jutting out of the planes. Parts were still snow capped, even in August, and you could see the glaciers in many of the canyons. We saw a moose by the side of the road as we were searching for a camp site. It was dark by the time we had to set up our tents, and raining a bit. Luckily the rain stopped by the time we went to bed, but it made lighting a fire near impossible. Chad and I were a bit anxious about camping in bear country. 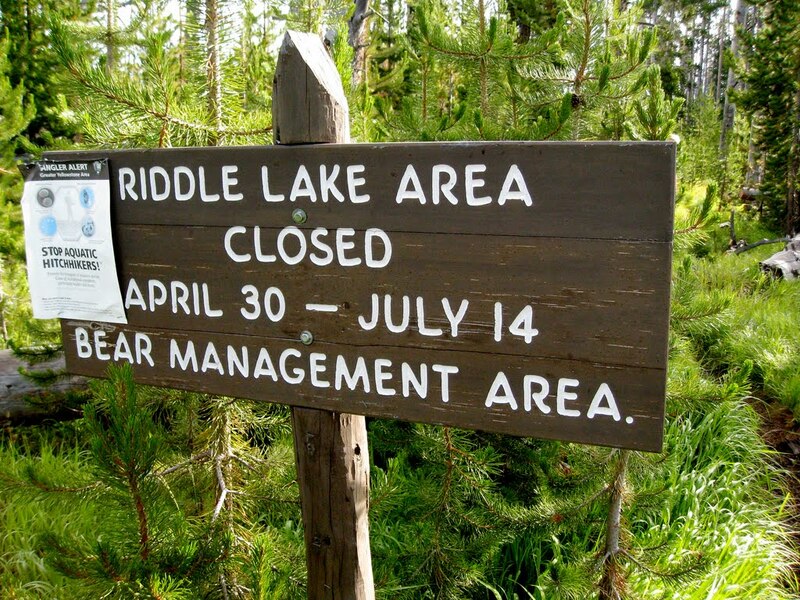 There were signs everywhere reminding campers to be 'Bear Aware,' store all food in a bear box or locked car, and to keep absolutely nothing (not even toothpaste or a water bottle) in your tents, because the scent attracts the bears. Thankfully there were no incidents, however I did have a dream the second night that bears were running around our tents. Just as they got to the tent and started sniffing around, I woke up like a lighting bold, heart racing. To make matters worse, just as I was about to fall back asleep I hear a pack of while dogs or wolves howling off in the distance. They don’t call it wilderness for nothing. 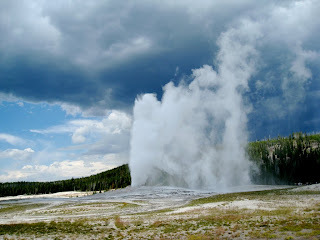 The next day, w e decided to do the touristy thing and we drove out to see Old Faithful. 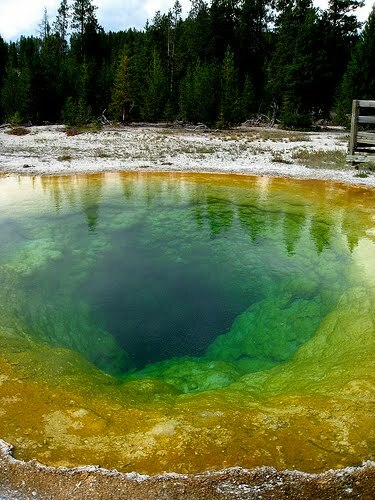 It is not the largest geyser, but, as the name suggests, it is the one that erupts the most pr edictably and most often. The entire thermal area was really interesting. It felt like we were exploring the surface of the moon. Some were just hot pools of water with several bright colors. Others were constantly bubbling, steaming and spitting. 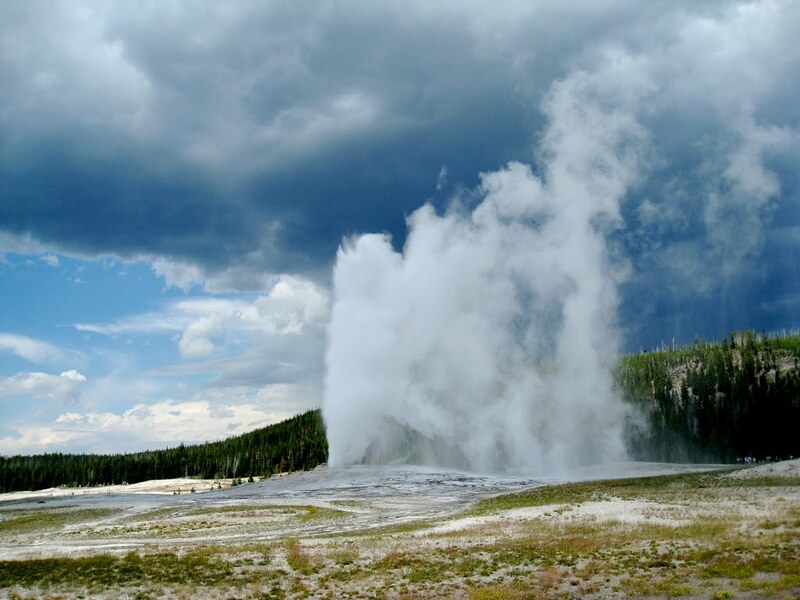 And others were large geysers that erupted anywhere from every 3-4 hours to once or twice a year. Later in the day, Chad rested in the car for a bit while Simona, Gisle , and I hiked out to a waterfall called Mystic Falls. It’s probably called this because all around the area are more thermal springs which create a steamy fog over everything. We even saw people sitting near the base of the waterfall in a hot spring. We passed one of the little streams of hot water running into the creek, and we touched it to see how hot it was. It was very hot, as if you run your tap water on h igh until it gets as hot as it can get. Strange. 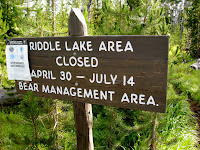 On our last morning, we hiked out to Riddle Lake. We were the only ones at the small rocky beach beside the lake, so it was nice and quiet and peaceful. We did not see any wildlife on this hike, as we would have hoped, but on our trip we did see buffalo, elk, and a 4 year old Grizzly from the car (which is as close as I want to get!). 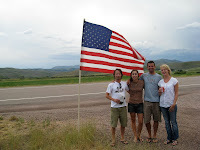 Gelareh and Raymond took us to eat at Freebirds, a great Mexican place, and Goode Company, the best BBQ in the state. We also ate a delicious cupcake at Sugarbabies, and had some wonderful homemade Italian cream cake and almond pound cakes baked by Gelareh herself. We spent some fun time by the pool, and had the opportunity to go to the WVU alumni event for the local Houston Chapter. The highlight of this night came afterwards in the parking lot when a drunk girl chugged Petron in front of her headlights while flicking us off. We were also introduced to a hilarious game called Apples to Apples. We played until the wee hours of the morning. The highlight of the entire weekend had to be the Pulp Fiction style hose down of the boys in the back yard. After getting drunk at an earlier than normal hour, the boys were being defiant and not willing to shower after a long day at the pool. Very long story short, the girls were not pleased with the dirtiness (and smelliness) of the situation, so we handed them a bar of soap and shampoo, and gave them a prison style shower right there in the back lawn. The photos from this are priceless, and no doubt tales of this night will be recounted for the rest of our lives. 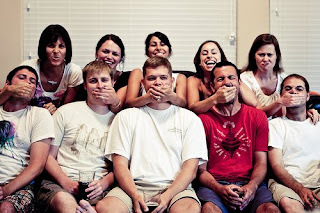 On Sunday, as Chad and I sat in the Houston airport, we were both feeling the pre-homesickness that comes with knowing that you are again leaving the familiar to go into the unfamiliar. I think because our trip was longer this time (almost 3 weeks), it was even harder to leave. We had such a good trip, and we did so much. At least we know for sure that when it is time to finally move back to the States, that we will be as happy as school girls on the playground (yes, even Chad).